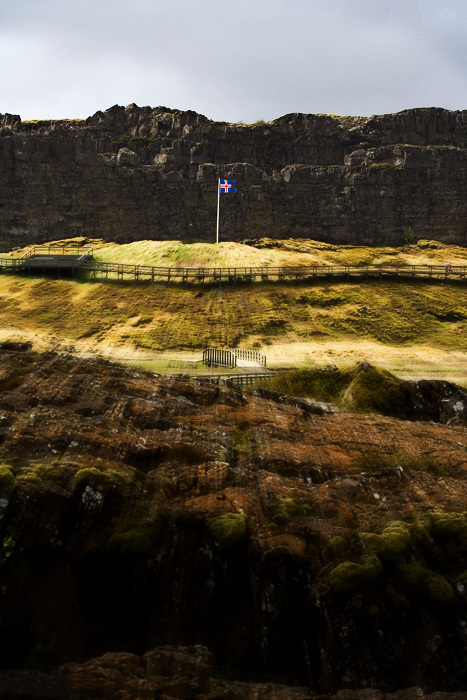 Apparently the old Viking parliament of Iceland used to meet here, this was their spot, and the lawspeaker would speak on the law stone… or the speaking stone… or the conch or whatever. This is also the place where the North American and Eurasian continents meet… or split – geography’s all very confusing, but anyway that’s what the cliff is, part of the Atlantic Ridge; the only place where it rises above sea level. Around the corner from this? The drowning pool. It’s where they drowned women guilty of adultery or other sins, like failing to make an adequate sandwich. Posted on Thursday, June 21st, 2007 at 12:00 am. Filed under: Iceland Tags: Iceland	RSS 2.0 feed.